The best security postures are those that are built on efficiency and time-to-response. While processes make it possible to get a job done faster, creating ones that solve practical problems and result in measurable efficiency gains can be a time-consuming task, and without the expertise required to create and build them, they simply don’t get done. This is where security automation comes in. 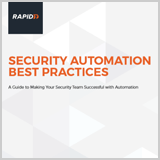 Security automation streamlines a series of repetitive, manual tasks into cohesive and automated workflows. With increased efficiency, better and faster decisions can be made, which in turn can improve your organisation’s entire security posture. Even better, with repetitive and manual tasks taken care of by automation, security personnel can instead focus on more strategic work, which boosts their job satisfaction and ensures you’re retaining good talent. No enterprise in the age of Agile can afford to ignore test automation.